In July we will be celebrating 30 years since the founding of our guild, and we have been contacting those members who were founders to take us on a trip down memory lane. Also, this will be the time to bring those quilt tops that you might want help in pinning to your batting and backing. We will help each other out. This is also UFO month, bring a couple of your UFOs, we would like to see them! Bring your oldest or your prettiest, or your “what was I thinking” UFO. 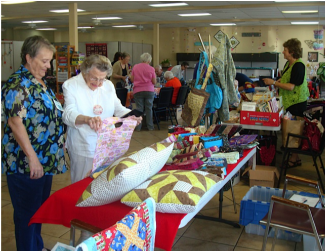 This is a good time to also start thinking about September’s white elephant sale for those sewing and quilting materials that you have hanging around that you want to offer for sale. We will start signing up for that. Cost of the table will be forthcoming. The $2 table has finished, and wow, what a nice opportunity that was to purchase nice fabrics for cheap!! A suggestion was made to me to have members bring to the guild meeting something made with fabrics from the $2 table. Please plan to bring these in October, so we can show them off. We can also take a picture as a way to thank the family that has offered all those fabrics to us at such a good pri ce! Last, but not least, our own Ellen Sherman will be teaching a half day class in August. She will be telling us more about it in this upcoming meeting. The cost will be $5 for members, $7 for non-members and she will make up kits for the class at a cost of $5. We have payment available for the class with PayPal, or cash or check. Sign up will be at the July meeting. I am so sorry that I missed the last meeting, but I was ill with some sort of stomach virus. I heard the square dancing and the presentation by Deda’s husband were both very well received. NOTE: To pay for this class online with your Credit Card, or your Paypal account, use one of these buttons. If you are a member and want to pay for this class use this button. If you are not a member yet and want to pay for this class, use this button.